3-star-hotel in the 7th district of Budapest. Address: 1077 Budapest, Dob u. 73. The hotel has 56 rooms. Three star downtown hotel, located in the business and shopping district. 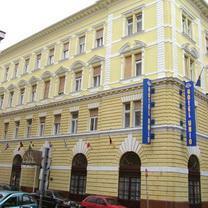 Easily accesible by public transportation, walking distance from the Parliament, Opera, Music Academy, Heroe's Square. Hotel Unio - Pleasant atmosphere, fine cuisine. Large open spaces decorated in early 20th century style combined with the comfort and technology of the 21st century. 52 rooms with double pane windows, with remote control TV, direct phone and minibar. Air-conditioning adjustable in every room. Special rooms for non-smokers, the disabled, hardwood floors for guests with allergies. 24 hour reception, safe, magnetic card door opener, computerized smoke and fire detection system, levels separated by fire doors, 2 staircases. Family style restaurant serving Hungarian and international cuisine. Conference rooms for up to 150 participants. Our elegant restaurant serves breakfast buffet. Lunch and dinner buffet with a wide variety of dishes is available to our hotel guests and for the public.